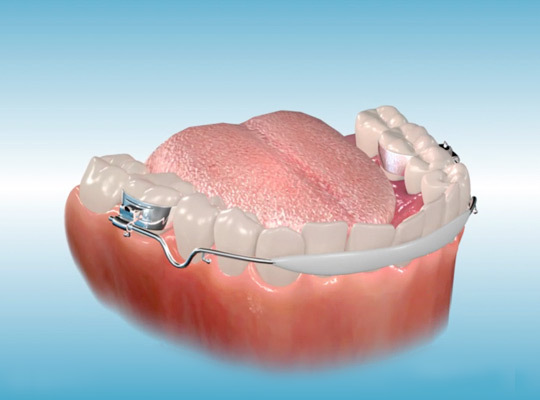 A lip bumper is an orthodontic appliance that is designed to correct or hold the lower adult molar teeth in an appropriate position and prevent them from coming forward. A lip bumper is ideally used during the mixed dentition, which means that the child has both baby (primary teeth) and adult (permanent teeth) in the mouth. The best time is when the permanent first molars have erupted, but the primary molars are still in the mouth. A lip bumper is not used for adults. Sometimes primary molars fall out too soon, and it takes time for adult premolars (bicuspids) to come out and replace them. If that span of time is too long, the adult molars can come forward leaving less space for the adult premolars to eventually erupt. 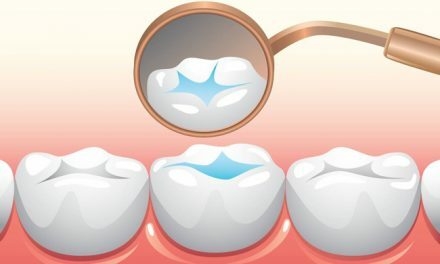 Therefore a lip bumper keeps the adult molars at their correct position after they have erupted, preventing a possible crowding with the premolars. 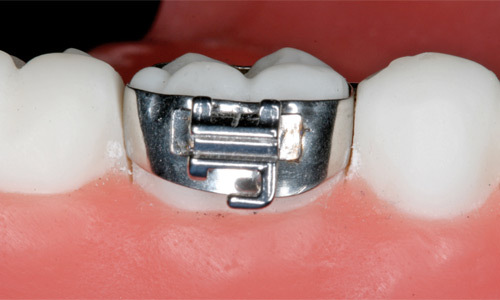 A lip bumper can also be used to align crowded lower front teeth. The front part of this functional appliance can act to block any pressure coming from the lip. The natural remaining pressure from the tongue can therefore create an expansion, moving the anterior teeth forward. This is achieved by placing the front part of the lip bumper in a certain position. This action should only be carried when the front lower incisor teeth are leaned to the back causing crowding. When activated in a certain way, a lip bumper can move back lower first adult molars. 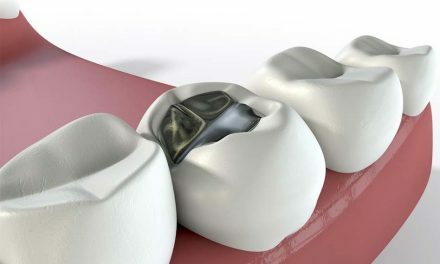 This limited movement can help create space when there is too much crowding with teeth that have already erupted. 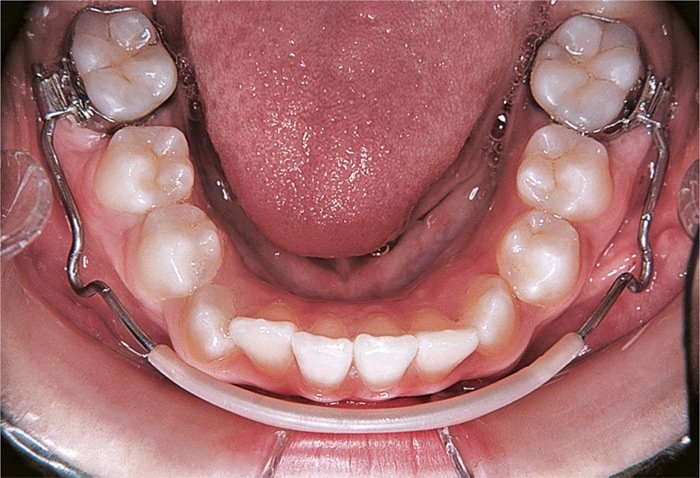 To hold back the lip bumper appliance in the patient’s mouth, bands are placed around the first adult molars. 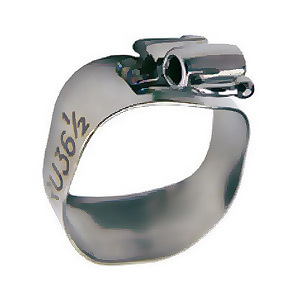 Bands are made of stainless steel metal material and look like rings that fit around teeth in a custom way. When the appliance is ready, those bands are cemented over the molars to keep everything stable in the mouth. Small tubes are attached to bands in order to allow the lip bumper’s wire to fit in. A small elastic holds the wire to the tube of the band. A single, thick, stainless steel wire runs on the outside of the lower teeth from the lower left first molar to the lower right first molar. This wire fits in the tubes of the bands. 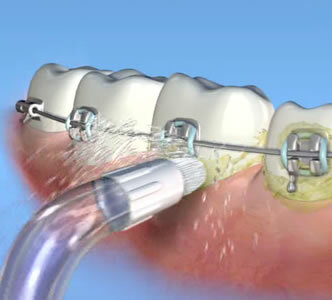 Two loops are incorporated in the wire, which can be activated by the dentist or orthodontist to make the appliance accomplish a desired work. Often, a small acrylic or rubber shield goes around the wire in the front area. It is placed there in order not to injure the gums and the lips in that place. A lip bumper will stay in a child’s mouth for about a year. It’s imperative to take good care of it, and also the teeth it’s on in order to have the best success from the appliance. 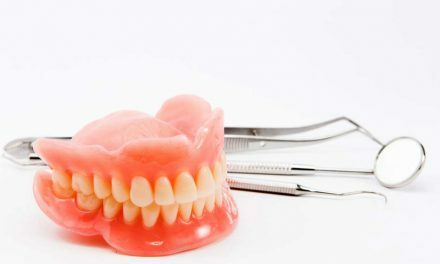 Lip bumpers can be either removable or fixed (tied in on teeth). If they are removable, it’s important to wear them 24 hours per day, except when brushing and flossing. Oral hygiene is very necessary in order to prevent problems like cavities and gum disease. Daily brushing and flossing is crucial to remove plaque and food debris from the spaces between teeth, gums, and the appliance’s components. If the lip bumper is fixed to teeth, an oral irrigator (Waterpik) can help remove remaining plaque and food debris after brushing and flossing. Gerety Orthodontic Seminars (Use of Lip Bumpers). Evidence-Based Dentistry (Do lip bumpers work?). About Health (Definition of Orthodontic Band). 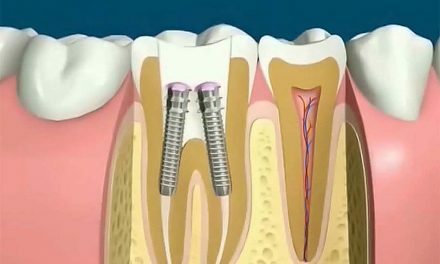 Scientific Electronic Library Online (Second molar impaction associated with lip bumper therapy).